The University of Washington Wind Ensemble is the select wind ensemble at the UW and is comprised of the finest wind and percussion players on campus. Under Professor Salzman’s direction the University of Washington Wind Ensemble has performed at a number of prestigious music conventions, has presented several world premiere performances of outstanding new music for wind band and in 2004, undertook a highly acclaimed nine-day concert tour of the Kansai region of Japan returning for more extensive tours of that country in 2007 and 2010. The UW Wind Ensemble presented several concerts in the main concert venues of Beijing, China in March of 2013, including a sold-out concert in the National Center for the Performing Arts in Tiananmen Square. In the spring of 2006, the ensemble was invited by the Seattle Symphony Orchestra to present a concert at Benaroya Hall as a part of the Symphony’s Made in America Festival. The London Financial Times review of the concert applauded “music of surprising sophistication…Cindy McTee’s Finish Line pulsated energetically and William Bolcom’s Song was simply gorgeous.” Subsequent to the 2006 performance the ensemble was invited for return appearances on Seattle Symphony concert series in 2007, 2008 and, most recently in 2011 when Maestro Gerard Schwarz conducted the ensemble. The UW Wind Ensemble has also collaborated with a number of internationally renowned guest artists, conductors and composers including Eddie Daniels, Steve Houghton, Allen Vizzutti, James Walker, Douglas Yeo, Leigh Howard Stevens, David Maslanka, Michael Colgrass, Cindy McTee, Eric Ewazen, Satoshi Yagisawa, David Stanhope and Huck Hodge. 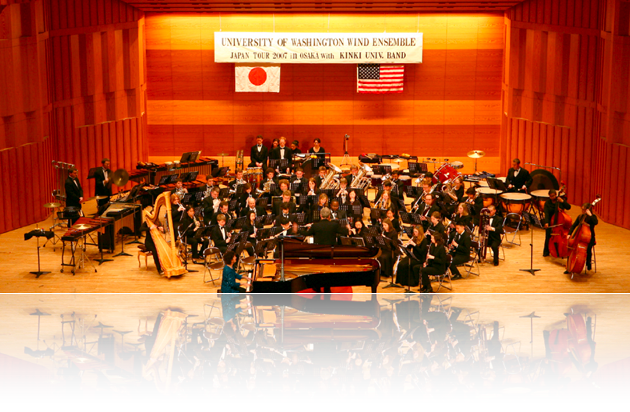 In July of 2008 Nihon Pals, a music education resource company based in Osaka, Japan, released a set of instructional DVDs regarding the subject of building ensemble musicality featuring Professor Salzman and the UW Wind Ensemble. Membership, based on audition, is open to the entire student body regardless of major field of study. Additional opportunities for student involvement in University of Washington instrumental organizations include the Symphonic Band, the Concert Band, the Campus Band, the 240-member Husky Marching Band, two jazz ensembles, several combos and the UW Symphony Orchestra. The University of Washington was host for the 2011 National Conference of the College Band Directors National Association. The Symphonic Band is the second auditioned wind group at the University of Washington, performing a repertoire of classic and contemporary wind music. Membership is open to students from all schools and departments of the University of Washington. Rehearsals will take place during Fall, Winter and Spring Quarters and will be held on Monday and Wednesday afternoons from 3:30 to 5:20 PM in the School of Music, room 35. The Symphonic Band performs at least one on-campus concert per quarter with occasional off-campus performances. Audition information can be found on the home page. The UW Concert and Campus Bands meet on Wednesday evenings from 7:00 to 9:00pm. The Concert Band rehearsals are located in Meany Hall, room #268, and the Campus Band rehearses in the School of Music, room #35. These organizations are open without audition. Professor Salzman will be assisted by graduate student conductors. The Concert Band and Campus Band are not just for UW students; faculty, staff and members of the community are also invited. Anyone who loves to play is welcome - making great music is a lifelong activity! The UW Studio Jazz Ensemble, widely acclaimed for its precision and excitement, aspires to set the highest possible standards of excellence for the performance of jazz in all its forms. The band is responsible for introducing the latest in big band material, while maintaining the roots of the region's healthy jazz tradition. The ensemble is open by audition to both music majors and non-music majors at the UW, and is designed to provide solid, professional training in the full range of musical styles inherent to jazz. Several smaller combos are also offered at the University. All are part of a burgeoning jazz program supporting seven faculty members in the areas of jazz performance, arranging, history, and improvisation. Studio Jazz I meets on Monday, Wednesday, and Friday from 12:30 to 2:20 PM in the School of Music, room 35. An audition is required for membership. The exciting 240 member UW Husky Marching Band rehearses four days a week during fall quarter and performs at all home games in beautiful 73,000 seat Husky Stadium. The band also offers members a chance to see much of the country as they travel to selected away games and participate annually in some of the country's most exciting holiday bowl games. A short marching and playing audition is required for membership, but students need not have prior marching experience. The Husky Band is open to all students at UW and offers scholastic credit for all its members. The Husky Band also appears at numerous university and civic events throughout the year. Other athletic bands available to members of the Husky Band are the Purple and Gold Basketball Bands, and the UW Volleyball Band as well as many enthusiastic pep bands that perform year-round throughout the Northwest.